At the Battle of Salamis the Persian navy, despite its vastly superior numbers, suffered heavy losses and was utterly defeated by the tactics of the Greeks in the narrow straights. King Xerxes, upon seeing his great defeat, headed back to Persia with what remained of his navy and part of his army. He left behind a huge force under the command of the Persian general Mardonius. With winter approaching, Mardonius withdrew from Athens, burned everything in his path, and settled in central Greece to spend the winter. 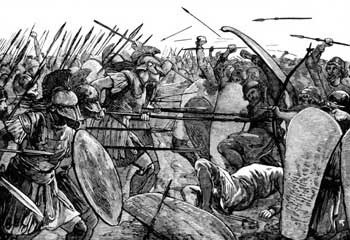 That portion of the Greek army led by the Spartans and numbering about thirty nine thousand men, had been waiting at Corinth for the outcome of the Battle of Salamis. They joined up with the remaining Athenian army. The battlefield to drive the remaining Persian army from Greece was to be at the city of Plataea. The battle took place in the spring of 479 BC. The well trained Spartans, under the leadership of their King Pausanias, fought strongly and withstood the charge of the Persians. 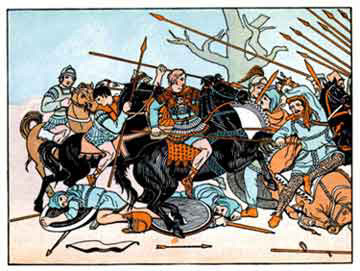 The bravery and discipline of the Greek army eventually defeated the Persians, killing Mardonius and most of his army. At the same time the Helenic league sailed across the Aegean and destroyed the main Persian fleet at Mycale triggering another revolt against the Persians in the Greek city-states of Asia Minor. The victory over Persia was the greatest of all victories won by the Greeks. It meant that Greece would stay Greek and not be absorbed into the Persian Empire as had so many other cultures. It meant that Greek influence would live and grow, to be spread further by Alexander and to be preserved and extended by Rome. The next year after Plataea, Sparta sent Pausanias, the hero of that great battle, to command the allied fleet and drive the Persians from the Aegean. Pausanias took Cyprus; he expelled the Persians from Byzantium, but his victories turned his head; he grew puffed up with pride. Ambition awoke in his heart , and he entered into plots with Xerxes-plots to betray all Hellas into the Great Kings hands. He planned to wed Xerxes daughter and make himself King of all Greece, subject only to Persia. As he dreamed these elaborate dreams, he began to treat the allies as though he were already their royal lord and master; he adopted Persian dress, protected himself with a bodyguard of Persians and Egyptians, and introduced into his household all the luxurious habits and customs of the East. Hearing of these intrigues, Sparta recalled Pausanias, but nothing was proved against him. He hired a Trireme for himself and returned to the scene of action. A second time Sparta recalled him, and now he was secretly plotting with the always dissatisfied Spartan slaves, the ever rebellious Helots, promising them their freedom and the rights of Spartan citizens if they would rise up and overthrow the government of Sparta; but once again actual proof could not be found against him. 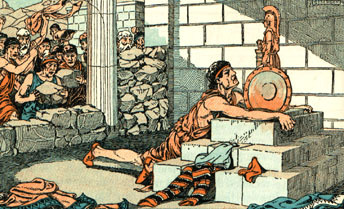 Argilius, his servant, however, being sent to Persia with a letter, began to think that no messenger who had been previously sent on such an errand by Pausanias, had ever returned alive; so he secretly opened the letter and found therein directions that the Persians were to slay him as soon as he arrived. Therefore he delivered the message to the ephors of Sparta instead of to the Persians, revealing all his masters plots. Pausanias fled for refuge to the temple of Athene; but the people, in their anger, hearing of his treachery, blocked up the door with stones, and the aged mother of the traitor, with the spirit of a true Spartan, laid the very first stone. So Pausanias was left to die of hunger and thirst in the temple, and the allies refused to receive another Spartan admiral as commander of the fleet. Thereupon Sparta, sulking, withdrew from the Persian War. And now it was found that Themistocles had likewise been involved in these base intrigues of Pausanias. He was not just then at Athens, for he had been ostracized because the people now favored his rival, Aristides, who had returned from exile. His plots with Pausanias were doubtless concerned with nothing more than the uprising of the Helots; for Themistocles would have liked to embarrass the jealous Sparta by a rebellion of her slaves; but the people assumed that he, too, had been intriguing with Persia. He was accused of high treason, and men were sent to arrest him. He fled across to Asia, pursued by Athenian officers, and seeking an asylum in the quaint and simple castle of Admetus, King of Molosia. The King was away from home, but the Queen with old fashion simplicity, was sitting by the hearth with her child. 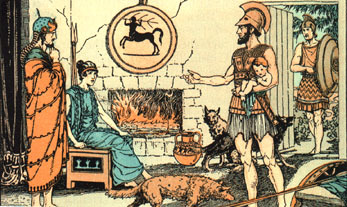 The queen bade Themistocles take the infant in his arms as he made his appeal to the King. So when the King returned and found the stranger holding his babe, he refused to give up his guest, and saved him from his pursuers. *A Picturesque Tale of Progress, Conquests 1, Olive Beaupre Miller. The ancient Greek playwrite, Aeschylus, wrote a play on the victory of the Greeks over the Persians. It is called The Persians. He had fought in the Battles of Marathon, Salamis and Platea. For a brief synopsis of Aeschylus' play, click below. If you would like to read an online version of the play, The Persians, click below.